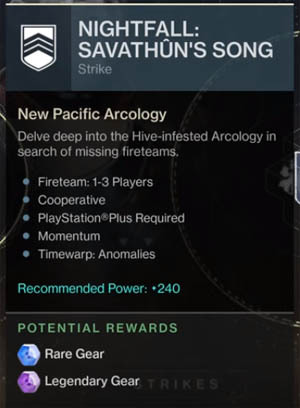 The Savathuns Song Nightfall is the last of the platform independent strikes to appear on weekly rotation. In this post you'll find a complete strategy guide for SOLO players wishing to attempt the Nightfall alone, with a strong emphasis on the best subclass, armour, weapons and tips for each of the Nightfall sections. Savathuns Song is a rather long and agreeably difficult Nightfall. 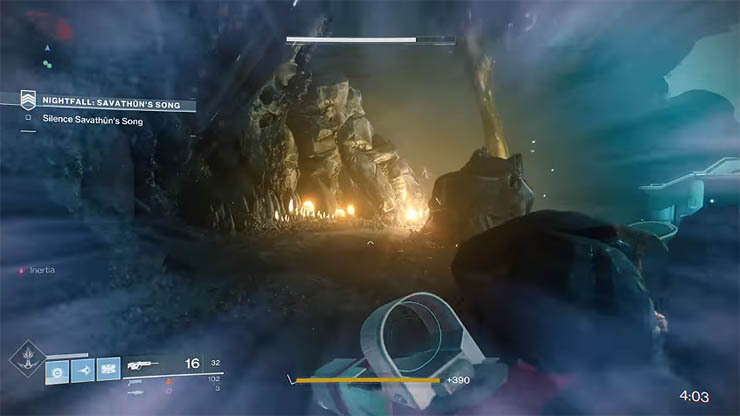 Taking place on Titan, the smallest on the playable zones of Destiny 2, Savathuns Song is packed to the brim with Hive enemies and some unique "slam dunk" mechanics. Choosing the right class and weapon modifiers is tricky since there are a variety of elemental shields: Knights have Arc Shields, Wizards have Solar Shield and Ultra Wizards have Void Shields. Sections are long and drawn out fights with arguably the strongest enemies of any Nightfall encounter. Ogre's ensure that players are drawn into long and painful battles whilst Hive knights take the biscuit with their Hive shields and regenerating characteristics. At the time of writing the modifiers for Savathuns Song are Momentum and Anomalies, neither of which are particularly great for SOLO players. Making its debut in Savathuns Song, Momentum disables a player's health and shield regeneration when standing still. Players must sprint in order to top up their health and ultimately stay alive. Running circles is a perfectly acceptable way to quickly regain health but running on the spot doesn't count (such as when facing a wall). The big problem with Momentum is that SOLO players can easily get caught in a circle of death: leaving an area of safety to regain health but thus putting themselves back in danger during the process. Tip: You only need to sprint to start health regen, you don't have to keep sprinting. The anomalies modifier is back after first appearing in Exodus Crash. Slightly better than Timewarp Rings, players must seek out and shoot Vex crystal lattices to increase the Nightfall timer. Successfully shooting an anomaly provides an additional 30 seconds on the timer. In total there are roughly 28 anomalies in this Nightfall. Anomalies do not automatically disappear after a set time, so when appropriate, leave them until a section is clear and then make it a priority to destroy anomalies before moving on. Unfortunately, Anomalies are spread thin in Savathuns Song, with only a couple per section presumably because of the shear number of encounters to complete. With the Momentum modifier active we once again have a health regeneration issue. Whenever this is the case, the Warlock class has a big advantage through it's Healing Rift class ability. I find myself once again recommending the Voidwalker Warlock subclass for this situation. With both Healing Rift and the Devour perk, players can ensure that when there is no opportunity to sprint, they can still regain health through other means. Slipping down the scale slightly, the Titan class still has the advantage of both the Barricade protective shield and double grenades. Whilst Barricade won't let you regen health, and although it provides no help when you need to sprint from cover, it still prolongs life through reduced damage. Having double grenades is never a bad thing and by choosing the smart Striker subclass you can utilize the double Pulse grenades for good effect. For the Hunter, smoke bombs are once again a useful tool to have on your side. With several sections requiring a "void charge" to be placed, smoke bombs can provide that much needed cover to sneak in unharmed. The bad news is that Hunters have no regen class abilities or other defensive tools to match the Titan or Warlock and their best Super (Golden Gun) is in a subclass that excludes the use of smoke bombs. Before we get close to DLC season or other major events such as Iron Banner or rewarding Faction Rallies, we are left with a well known set of weapons. Most of you will by now have realised that Nameless Midnight is the weapon on everyone's mind. If you still haven't managed to grab that Scout Rifle with an area of effect damage perk then do so now by trading Strike tokens with Zavala. As for the Energy slot, this is open for debate. The Savathuns Song Nightfall contains a mixture of shield types, making no one particular weapon the best choice. In my opinion the toughest enemies are the Hive Knights which bolster an Arc shield. For this reason, it's a good idea to go prepared with a strong Arc Scout Rifle, Hand Cannon or possibly Auto Rifle. Of the Energy weapons available in Destiny 2, the "Conspirator" Scout Rifle that comes from the Leviathan raid, is probably the best in the game. Uriel's Gift is also a dam fine gun albeit an Auto Rifle. Whatever your choice of weapon, swap in an Arc mod for this Nightfall. Finally on to the Power Weapon slot. By now everyone should know of the well tested and much loved Rocket Launcher that goes by the name of "Curtain Call". Armed with cluster bombs, it's hands down the best long range, high damage launcher in the game. 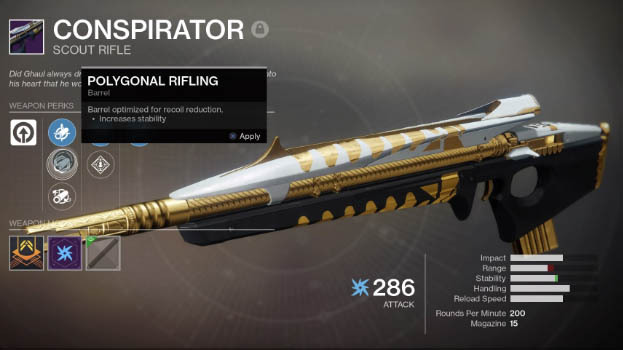 However, if you don't mind sacrificing an exotic slot on a Power Weapon then the Wardcliff Coil is also great considering the repeated occurrence of tightly packed, shielded enemies. There's more risk with Wardcliff though, requiring you to get slightly closer to enemies to fully enjoy the "shotgun" style of launcher that it is. If you do go for a Legendary Power Weapon, it's worth equipping a Solar damage mod to help with the Savathun Handmaid wizards, of which there are several. Completely forget about shotguns and swords for this one, it's just too risky getting up close. When Momentum is an active modifier for the Nightfall forget all about regen mods for your armour - they're useless. Instead, maxing out your armour mods to improve grenade recharge for your selected class is a wise move. Mods that improve reload speed on your most effective weapons are also worth considering. Most importantly, your exotic armour piece should make a huge difference. 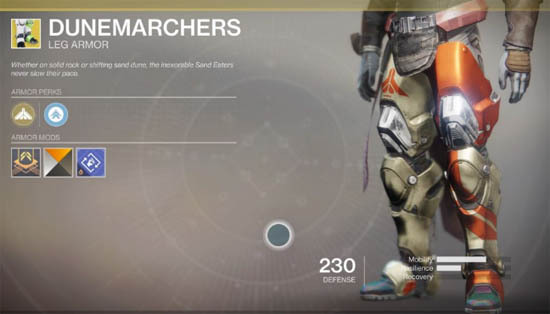 For example, Titans could opt for "Dunemarchers" for it's unique perks, offering increased sprint speed and a static charge that upon melee will chain to nearby enemies. With so many Thralls in this strike, having a stronger melee is going to be beneficial. Hunters, you have the option of Celestial Nighthawk again, providing an overpowered Golden Gun with extremely high damage output. This is perfect for taking down the strong Ogre's that prove to be the sticking point throughout the Nightfall. Of course this means going down the Gunslinger route and sacrificing the Nightstalker smoke bombs. As for Warlocks, your pre-DLC exotics are fairly weak. Of the bunch, Karnstein Armlets looks a good choice if you want to run the Stormcaller subclass with Pulse grenades. Karnstein will give you extra health, grenade and class ability energy following melee attacks. With a large number of Thrall in this Nightfall, you'll be topping up your abilities fairly quickly. Alternatively, choose between Crown of Tempests or Eye of Another World for fast recharge rates. Sprint out of the starting building and immediately deploy your sparrow to race across the bridge to the next building. Kill the two yellow enemies to proceed further. Hop through the multi-coloured wall and into the much large room. If the Anomalies modifier is active then you'll find 3 anomalies in this area. Check carefully above head height at either end of the large area, and in the centre above the statue. There's no harm in shooting these anomalies now since the room is relatively quiet at this stage. Shift to the left hand side of the room, clear the yellow traps and finish off the single wizard by the door. Let Ghost hack the entrance and now commences a wave based attack. The objective changes to "Protect Ghost" and 2 Wards must be disrupted to progress further. A swarm of enemies will flood the room, consisting of a shielded wizard, knight and many low level mobs such as Thralls. Deal with the shielded wizard first since he poses the greatest threat. Move away from the entrance that Ghost is attempting to hack to buy yourself some space to deal with mobs but also sprint to regain health if required. Now is the perfect time for Voidwalkers to engage Devour since there are so many "punchable" thralls in the room. Titans, set up your Barricade to protect the flanks. Whatever you do, don't waste time here. Save a batch of Rocket Launcher shells for each of the Revenant Knights and a strong grenade to get the job done. Take some time to collect any dropped Power Ammo from this room as you'll need it fairly soon. Tip: The revenant knights jump down from the rooftops as a group. Catch them early (and by surprise) with your Power Weapon and you've already done the hard work. After entering through the hacked entrance, two small groups of Thralls await inside. Again, it's the perfect time for any melee focused perks here: Devour for Voidwalkers or even Rallying Force and Defensive Strike for Sentinel Titans. Inside the next room awaits a Hungering Orge, a slow but insanely strong beast. This is your first taste of an Ogre and sadly it won't be the last in this Nightfall. Remain outside the Ogres room, using the wall as cover as you dip in and out of a long range firefight. Use whatever Rocket Launcher ammo you have left to get rid of the overpowering Ogre. There's an anomaly right above the entrance to the Ogre room, step inside then turn and look up to see it. These sections shouldn't take you more than a minute or two to progress through if you want to have any chance later. If you do end up dying more than twice then it's better to restart the Nightfall rather than attempt to push through. Aim to have around 10-11 mins on the clock by this stage. After clearing the Orge room, the objective changes back to "Find the Lost Fireteams" once again. Sprint through the rooms to reach the next section. As you enter the Arboretum area, more anomalies will appear. Check the ceiling above the first enemy encounter and the small room to the left after clearing the majors. Again, do not waste time here, this is a simple section compared to what's to come. Keep sprinting through to the giant area with the huge colourful screen. Once you see one of Savathuns Handmaidens (shielded wizards) you know you've reached the first "slam dunk" section. There's a purple glowing ball on the floor, a void "charge", that you must pick up and place in front of the shrieker. For now there is no need to go rushing into the room. Stay back and use the wall as cover whilst you pick off enemies. Sprint up and down the previous room to reclaim health if required. When the coast is clear, sweep the lower level (by the charge) with a Power Weapon or grenade and pick up the charge. Dash to the shrieker and plant the charge quickly. For Hunters this is the time to use smoke grenades to conceal your position, buying you time to place the charge. Titans can also use Barricade to provide a protective wall against the shrieker. Before leaving this section take note of the Anomalies. One is above where the wizard was, tucked in between the ceiling decorations. Another is to the right of the wizards platform, near the giant colourful screen. The last is directly above where you picked up the charge, look high up to the ceiling again. Aim to have around 10-11 mins on the clock at this stage. Progress forward, taking note of the additional anomalies before you jump down into the Hive tunnels below. There is one anomaly to the right, after leaving the shrieker room but before jumping down the hole. Another directly in front of you at the top of the hole. One on a ledge halfway down the hole (shoot from the edge of the hole while up top). One last one at the bottom of the hole where you scan the summoning seal. Scan the objective with Ghost and wait as he wastes precious time talking before you can eventually push through into the smaller chamber full of crystals. Use a strong Power Weapon backed up with a grenade to quickly clear the tightly packed room and destroy the crystals. Move on again, into a much large room with another Ogre and a hell of alot of knights this time. This is where you'll appreciate the time still left on the clock. Stay well away from the fight, using range and whatever cover is available to slowly take down the threats in this room. There is an Anomaly just as you enter this area, up above on the giant circular ring and another one in a similar position. Tip: You can jump on top of the roof that separates the two Ogre areas - use the curved ledge that runs across the entire roof as a springboard to get there. Once on top, shooting down to the Ogre is easier and far safer. Once the first Ogre is killed there's a second one that spawns in. If you're brave enough, stay on the roof, or drop down to ground level and stay close to the curved wall that leads around the side. Use the curved wall as cover at all times. Unleash as many of your stored Rocket Launchers as possible, combined with grenades as you slowly but surely chip away at the Ogre. Take note of the final Anomaly here, it's hidden over the right hand ledge where you could fall to your death. Tip: If you're the braver type who decides to stay on the roof then it's entirely possible to kill the two Ogre's and then skip all of the other enemies in this section. The blocked passage way will clear after the second Ogre is killed, allowing you to sprint onwards. When ready, push into the smaller Hive chamber and clear the 6 crystals. Aim to have around 9-10 mins on the clock at the end of this section. Another large and continuously section that consists of countless wizards, knights and other hive enemies. There is another void charge to complete in this area. By now you will have learnt that engaging from distance is the safest way to progress this Nightfall. Use cover as you move gradually through the rooms of the Arcology. Time is precious again, so although you're striking from distance, keep the pace up. Now is a great time to remind you that void charges do NOT have to be constantly carried from pickup to implantation. They can and should be dropped as you edge closer to the objective. They DO despawn if you drop them for longer than 20 seconds so make sure you are constantly picking up and dropping the charge to keep it alive. Players can also melee whilst holding a charge, perfect for dishing out damage to nearby Thralls or smashing an Anomaly along the way. When you come to the void charge implantation part get ready for a death! This is one of the hardest parts of the SOLO Nightfall to survive and it takes skill and a large dose of luck to get through unscathed. With the charge in hand, dash down the right hand side, using the pillar as cover for a brief moment. Warlocks dish out a Rift to instantly heal and then go for the final run and smash. Hunters go invisible with smoke bombs, and Titans...well, best of luck to you! So long as you plant the charge, the shriekers will die and a death is acceptable. Once the void charge is out of the way, the objective changes to "Rendezvous with Takeo-3" as you progress through dark Hive tunnels filled with Cursed Thrall. Remember to collect the hidden Anomaly before jumping down into the tunnels, it's hidden in the left hand side cave. Once down into the tunnels, aim for the Thralls head and keep a safe distance to avoid splash damage. Keep up the pace and watch out for three Anomalies in these tunnels. Aim to have around 7-8 mins on the clock at this stage. Upon entering the final BOSS room, keep well back, right by the entrance. Use the ragged rock wall in front of you to hide behind (crouch) as you shoot over the top, from long range at the BOSS. Stay in this area, taking long pot shots with your Power Weapon until Savathuns Song moves from its starting position. Each time Savathuns Song moves, groups of enemies will spawn into the room, getting progressively stronger each time. Make a point of clearing ads from the area before once again attacking the song from distance. The safest spot is close to the entrance of the BOSS room since ads spawn into the room from the two far corners of the arena. You want to find a pillar that allows you to just about see over, and shoot over, but one that the orbs from Savathuns Song can never hit you. There are several of these throughout the room and as long as you're far enough away, the angle is always in your favour. Tip: You can shoot down the purple orbs that the song fires at you. The good thing about this BOSS is that it remains stationary. So long as you have cleared the room of other threats, and have found a good cover spot, then damaging the song isn't a problem. There's not much else I can say to guide you through this fight, it's mostly going to come down to player skill. So long as you have built a decent timer, then you have the luxury of patience in this fight. With such a large arena, you can stay clear of attacks by making good use of the large and extensive rocks, walls and other barriers in the room. When (hopefully) the time comes to plant the void charge to finish the fight, make sure you move very quickly to clear the wizard guarding the charge and then make a dash for it with the charge. A death whilst planting the charge is acceptable here. Savathun Song will change to using seeking orbs in the final health bar phase, making it extremely difficult to push through as a SOLO player with all the attention on you. Use everything you've got left and maybe, just maybe, you'll make it through this one!